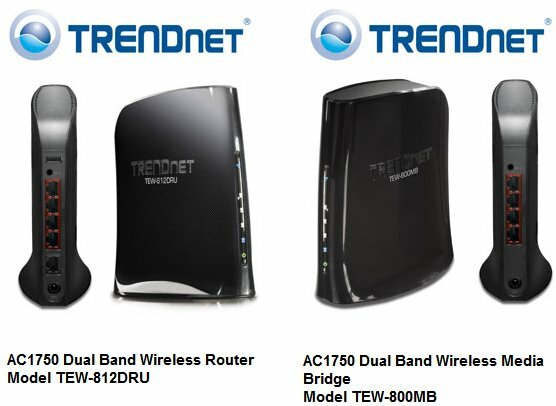 TRENDnet, a best-in-class wired and wireless networking hardware brand, today displays from Computex Taipei, the AC1750 Dual Band Wireless Router, model TEW-812DRU, and the AC1750 Dual Band Wireless Media Bridge, model TEW-800MB. The explosion of wireless devices in the home and office, coupled with high demand for HD video content, continue to drive demand for increased wireless bandwidth. 802.11ac is a new wireless standard designed to meet tomorrow's extreme wireless bandwidth needs. TRENDnet's AC1750 Dual Band Wireless Router, model TEW-812DRU, is a concurrent dual band router. The 5 GHz 802.11ac, or wireless AC band, is rated at an incredible 1300 Mbps. It can handle extreme loading and can easily stream multiple HD videos throughout the home. The router's 2.4 GHz 802.11n, or wireless n band is rated at 450 Mbps, and is designed to network all mobile, laptop, and other devices with built in wireless n.
The TEW-812DRU comes with a three year limited warranty and will be available from TRENDnet's online and retail partners this coming November. TRENDnet's AC1750 Dual Band Wireless Media Bridge, model TEW-800MB, connects up to four media center devices to an ultra-high speed 1300 Mbps 802.11ac network. Experience the seamless exhilaration of gigabit wireless speeds. Four gigabit ports connect Internet TVs, network video recorders, media players, and more. Wi-Fi Protected Setup (WPS) integrates other WPS supported wireless adapters at the touch of a button. Beam Forming technology improves wireless transmissions around physical obstacles. The TEW-800MB comes with a three year limited warranty and will be available from TRENDnet's online and retail partners this coming November.